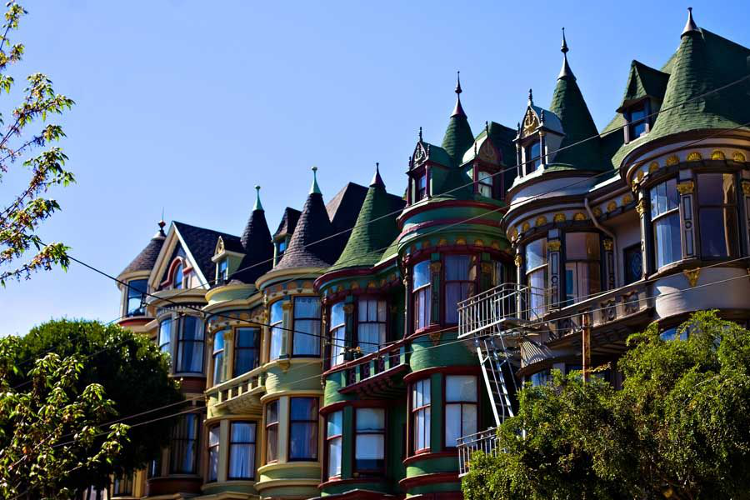 If it can be said that there was a renaissance period of American architecture, then it had to be San Francisco in the 1890s. The city was vibrant with possibility; buildings were being designed that had never been imagined before. And in the middle of this was a twenty-something young man from Petaluma who was absorbing it all. Was Brainerd Jones a genius? A genius is not simply a person with a big grab bag of tricks and techniques. Whether he was a genius or not I can't say - but he was definitely an artist. Or can we say any of his work qualifies as a masterpiece? A masterpiece is more than the sum of its parts, checking off items from a list of what's considered attractive and pleasing - at the time. To weigh the merits of a work of nice architecture, I like to play a game called, "How easy would it be to screw this up?" Instead of bringing sand-colored stone from the quarry at Stony Point, Jones could have used basalt from McNear's quarry less than a mile north of town. 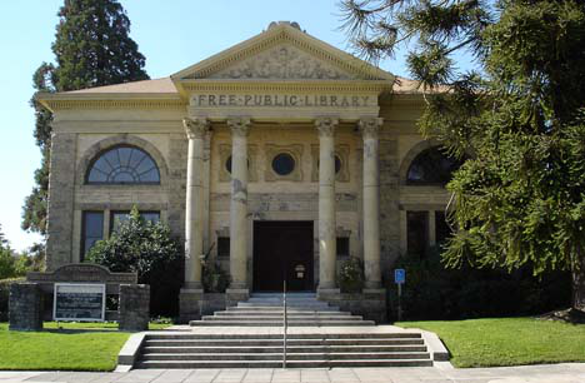 Besides being locally sourced, the dark gray stone would have matched Santa Rosa's Carnegie Library, which was built in 1903. Brainerd Jones was born in Chicago in 1869, moving to Petaluma at age six after his father died. As a teenager he was recognized at the local fair for his drawing skills and his ability in “netting,” which is a kind of crocheting. He supposedly took art lessons from Max Roth, a marble cutter and monument maker who had a yard on Western ave. The first sighting as an adult (at least, that I can find) is as a carpenter in Tiburon in 1892, and a carpenter in San Mateo the year after that. His first known professional gig was as a draftsman in 1896 for the construction firm McDougall & Son. This was not a prestigious place to work; although their main offices were in San Francisco, between 1894-1897 most of their work was around Bakersfield building hospitals, schools and jails. The successor business, McDougall Brothers, became quite important after 1906 and remained so for the next twenty years. That was long after Jones was gone, however. 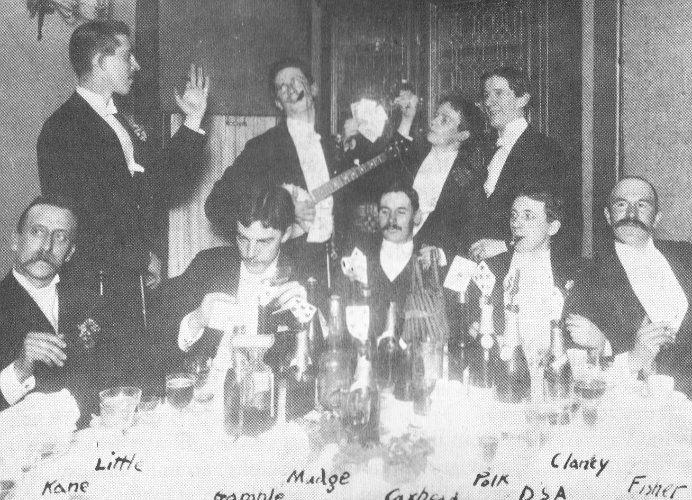 The San Francisco that Brainerd Jones knew was still a gaudy party town, but by the mid 1890s it was quickly developing a reputation for cultural and intellectual advancement. 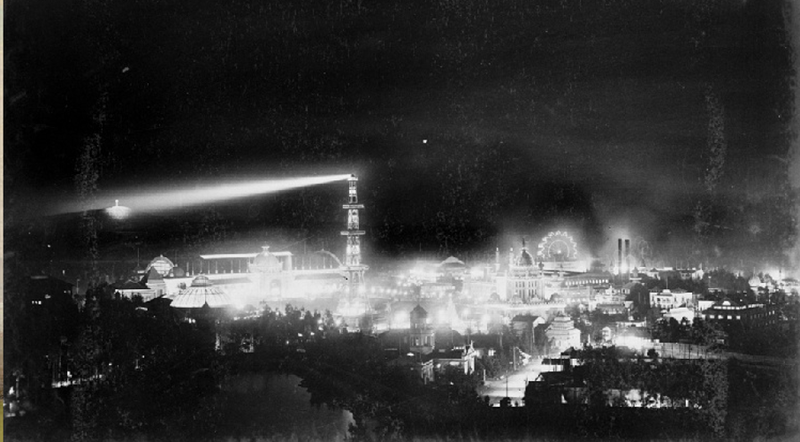 The 1894 Exposition in Golden Gate Park celebrated the city's progress and drew 2.5 million visitors. 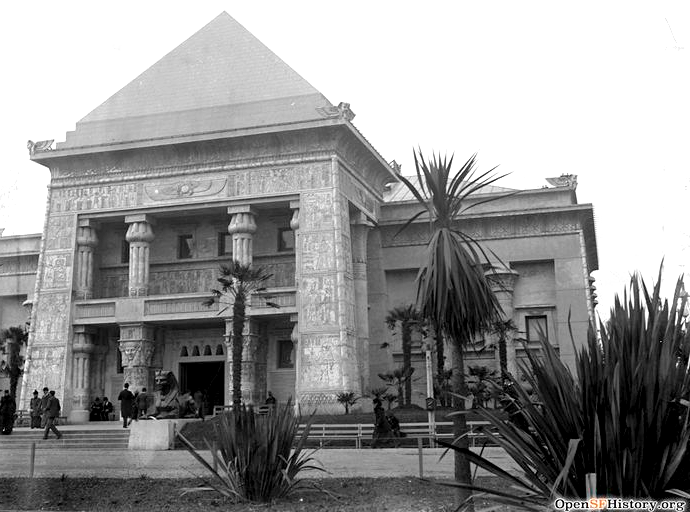 This world's fair also brought the city its first art museum in this odd, neo-Egyptian early version of the de Young. 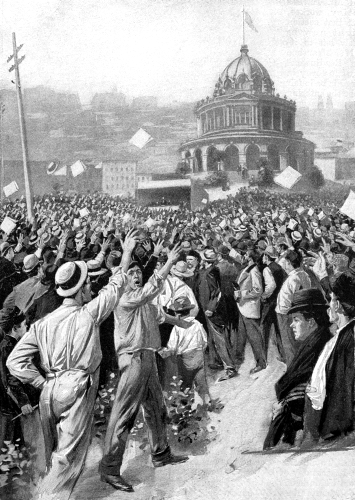 This was also a time of heated politics and kinds of activism. 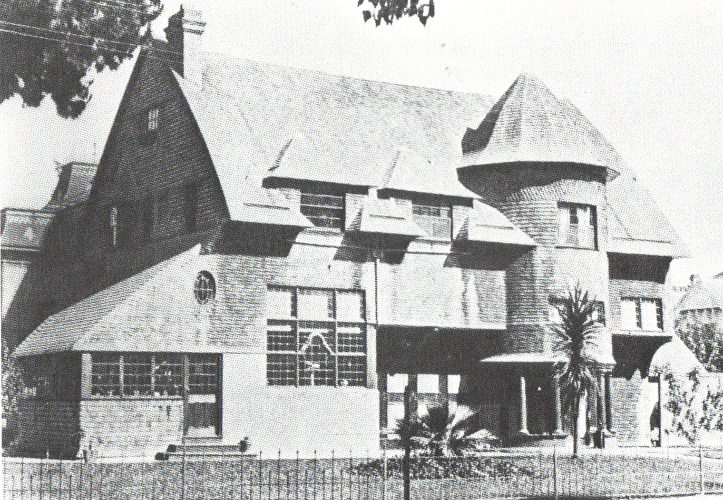 Architecture was no exception; In “the Wave,” the leading local periodical of literature and the arts, Willis Polk savagely attacked the popular Queen Anne style, with photos of “monstrosities” on “Chaos Avenue.” After the 1906 earthquake, Polk would play a key role in the “City Beautiful” reconstruction of San Francisco. The excitement wasn't contained to San Francisco. 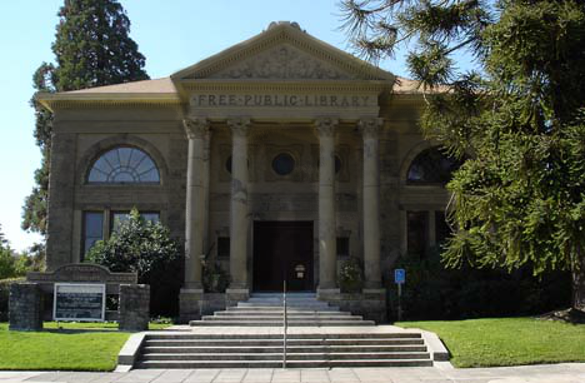 Berkeley and Oakland were becoming the intellectual centers of the Bay Area, thanks in part to the growth of UC/Berkeley and the enormous donations from the Hearsts and Levi Strauss. Although Jones only lived four or so years in San Francisco, imagine being twenty-something and having all this swirling around you. There was probably no better time or place in American history to be studying architecture. Just as the Shingle style had architects arguing over “unity,” the byword in artistic Californian circles was simplicity in all things, and living in surroundings as natural as possible. 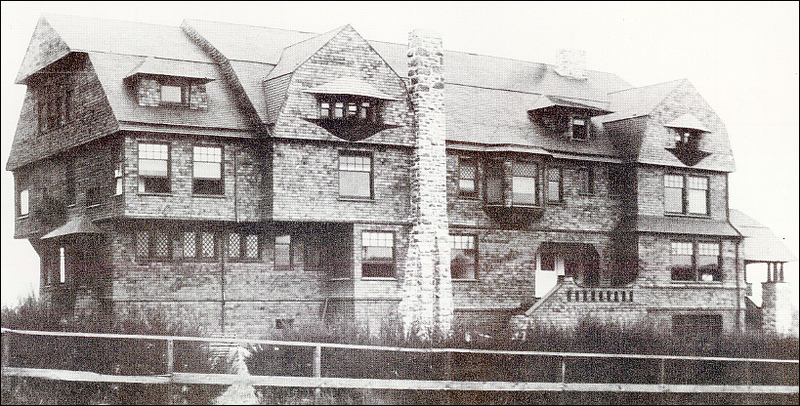 Poet Charles Keeler, whose Maybeck home was shown earlier, wrote: “The home must suggest the life it is to encompass. The mere architecture and furnishings of the house do not make the man any more than do his clothes, but they certainly have an effect in modifying him.” The popular architecture magazines discussed the philosophy of John Ruskin, with “Ruskin Clubs” in America joining the movement already in England. 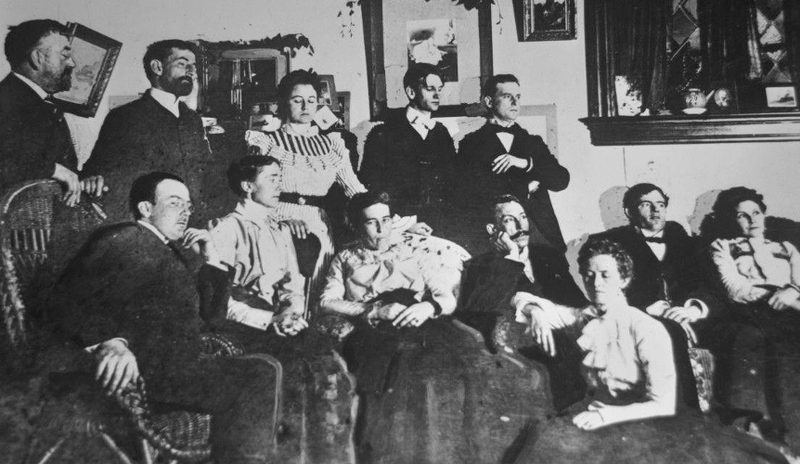 In this photo c. 1901, the man seated on the far right is Jack London. 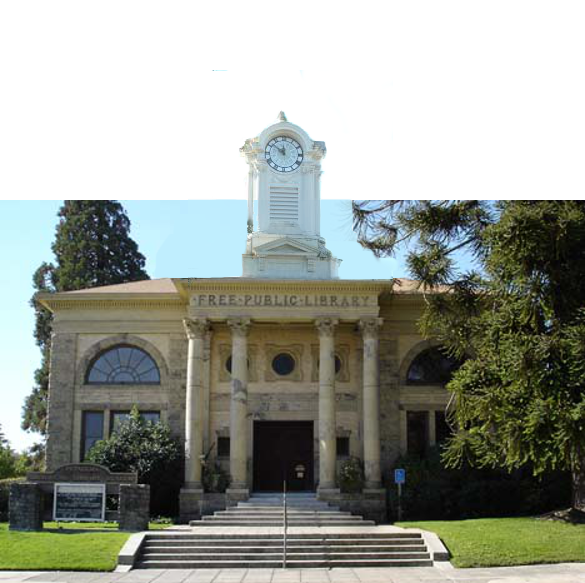 Jones moved back to Petaluma in 1898, where he registered to vote and gave his profession as “glassman,” which presumably meant someone who worked in leaded and stained glass. This window is from the dining room in a 1901 home designed by Jones. In the 1900 census he's listed as an architect living on English street. 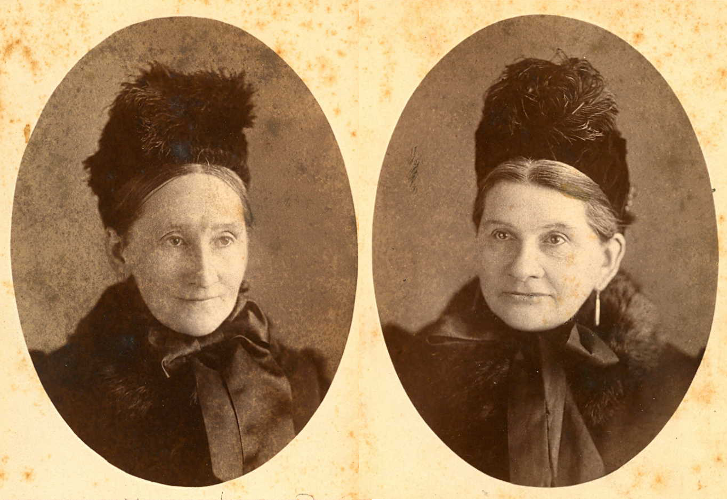 Jones' first known commissions came from sisters Mary Theresa and Helen Burn in 1900 and 1901 (MORE on the Burn family). 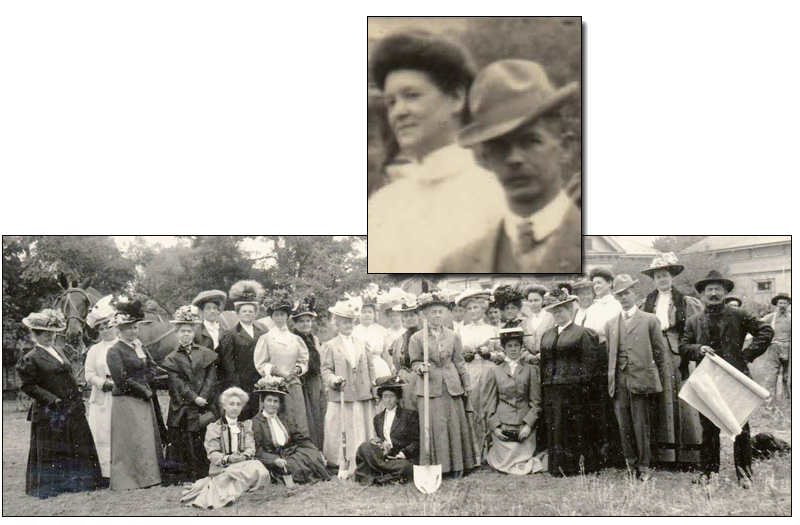 They lived in Petaluma from 1900 to 1907, but why they came here is unknown; they previously lived in Chicago and were originally from the Kitchener, Ontario area. Mary - who went by the name, "Miss M. T. Burn" - had a business on Main st. where she taught and sold "fancy work" (embroidery). The four cottages they commissioned were scattered on both east and west side lots. One is definitely lost, one can't be found (and may not have been built) and one has been heavily modified. 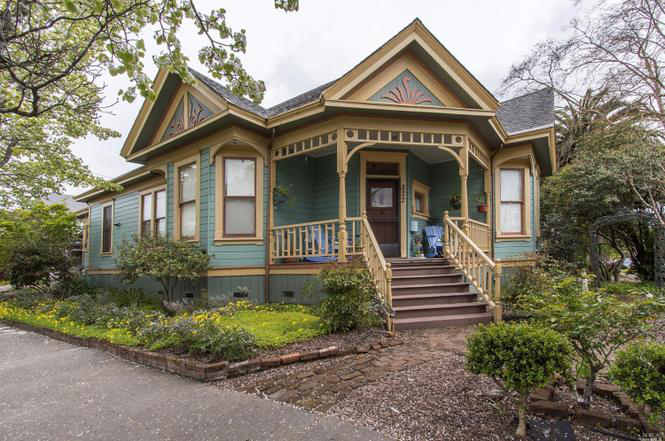 The best surviving Burn cottage is at 332 Post street and is firmly in the popular Queen Anne cottage style, using spindlework to frame the porch. 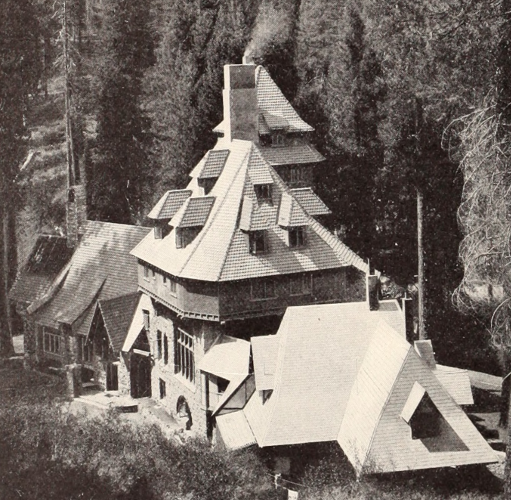 This was the last of the four Burn commissions, being built in late 1901. The Byce House at 226 Liberty street also dates to 1901. It's mostly a conventional Queen Anne with a corner tower and the usual fish scale shingles. The window pediment and ornamental molding around the attic window are neoclassical, but all the finials are gothic, as is the metalwork around them on each gable. Compare the Byce House wit the 1904 Harriet Brown House at 901 D st. They share some similarities, such as the porte-cochère, but this house might be his most conservative design. Victorian neoclassical elements are everywhere, from the widow's walk at the top to the profusion of finials to garlands on the columns. Of interest is the use of two elements that would become Brainerd Jones' signatures: The “union jack” pattern (actually classical Roman) and deconstructed Palladian windows. Note the bit of whimsy in the attic gable, which has a broken pediment inside another broken pediment – something I've never seen before. 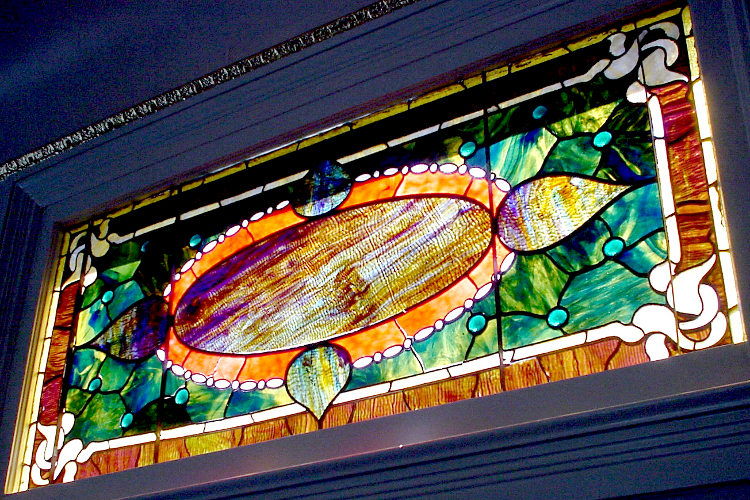 The stained glass seen earlier was from the Lumsden House; here is another example. Like the other two homes we've seen from 1901, the Lumsden House is firmly American Queen Anne style. This was probably the busiest year of his career, with no fewer than nine houses under construction. At the exact same time this was being built, the Blitz Paxton House was going up next door. Although the building was torn down in 1969, its footprint can be seen on the old fire maps. Guesstimating from the irregular shape, Paxton House was between 6,500 and 7,000 square feet - the largest residence Jones ever designed (MORE). 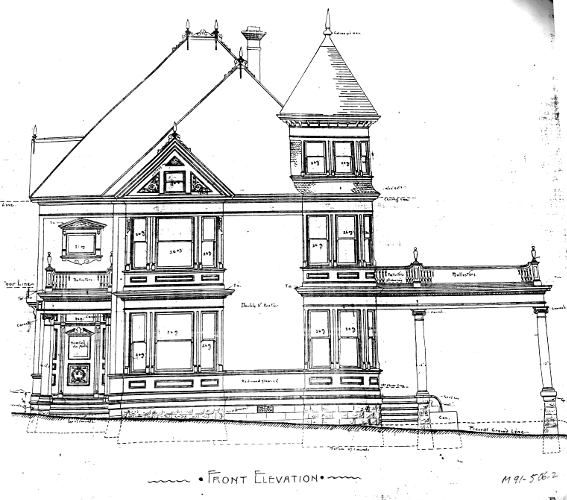 As far as I know, Jones was the only architect who designed in both the popular Queen Anne style and the more artistic Shingle style. In my opinion, this was based on the 1892 Anna Head school seen earlier. They have the same massing – a wider than usual building with a heavy roof. 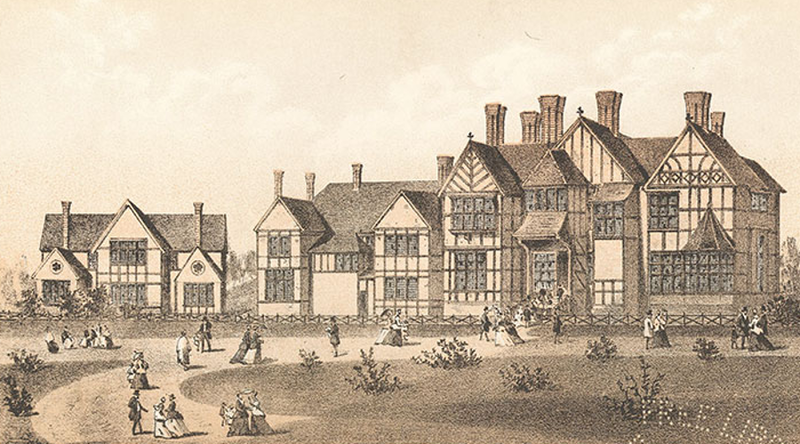 This view of the Paxton House clips off the southern end, but in the next image it can be seen there was a significant gabled extension projecting out from the main building. Although the face of both buildings is anything but flat, they share deep eaves and a second floor slight overhang which creates a shadow to emphasize the horizontal lines. Both used decorative corbels to lend an illusion of support for projecting walls. Even if all the similarities were coincidental, they shared an unusual design for the entrances, with the front door recessed several feet and steps coming up sideways, from the left. The porch landing is concealed by a parapet, and we know from the family photos the Paxtons used this as part of their main outdoor living area, which was in keeping with the design principles of the artistic shingle architects. Three years later, Jones designed another Shingle style house for Paxton's friends who lived two doors down on the same block. 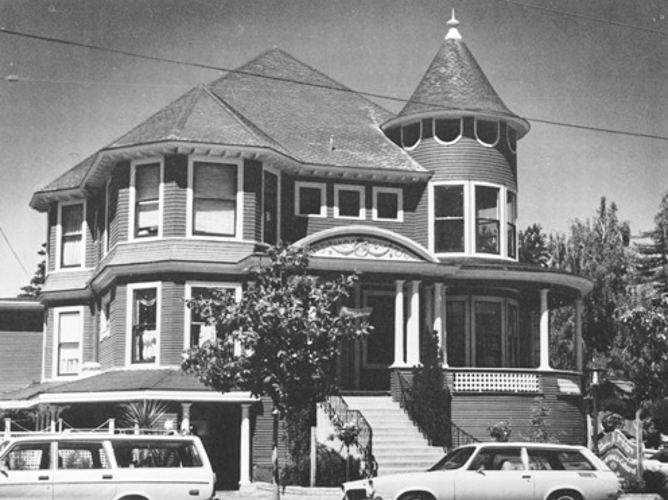 Now known as Comstock House at 767 Mendocino avenue, the two houses must have made quite a statement. 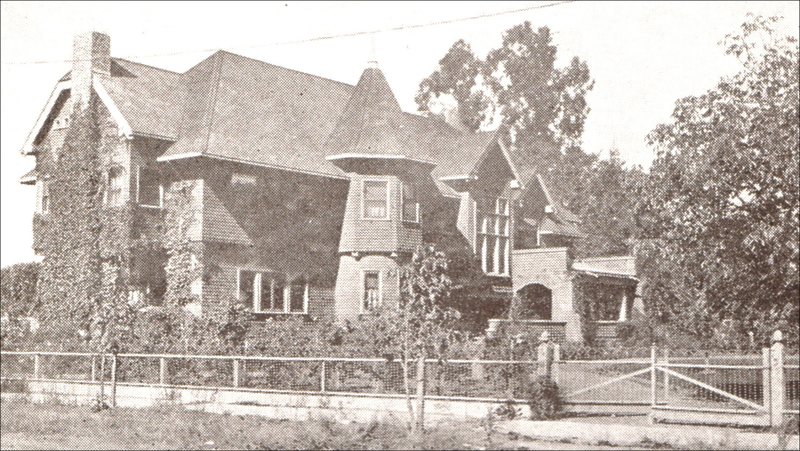 Seen here just after completion in 1905, the house had an astonishing number of windows and many whimsical features. Almost everything appears off-center; left/right, front/back views of the house are never symmetrical. 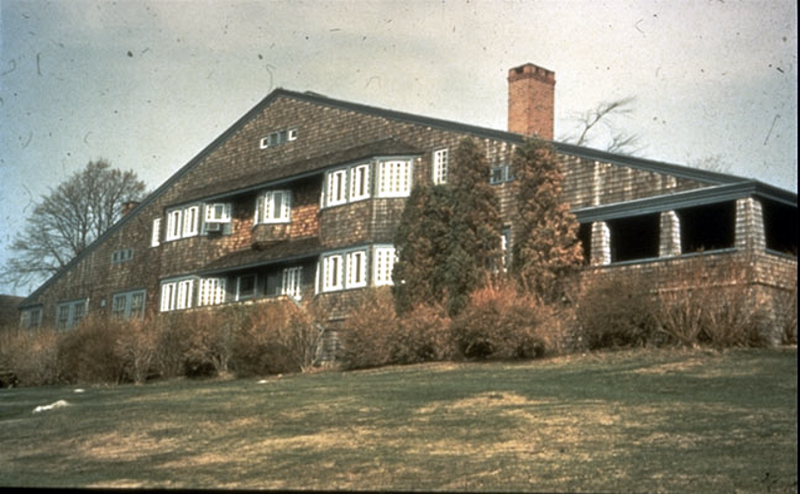 The right sides of the gambrel gables are uncompleted (but on the east and south side only) and on south end of the porch is a decorative giant corbel that appears to be supporting the top floors. The deconstructed Palladian attic windows are above another set of deconstructed Palladian windows. In his directions to the contractor Jones even embraced the radical ideals of Wills Polk and specified no paint was to be used on any wood, inside or out; architecture, in this view, a house was no different than fine, artisan furniture. 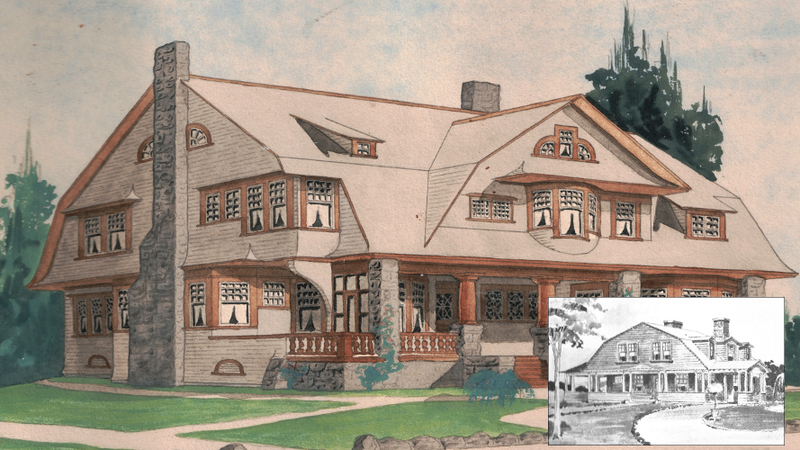 But the design also shows Jones was closely following the new architectural ideas appearing in magazines, particularly Stickley's “The Craftsman.” In 1904, Jones painted this concept shortly after Stickley published the design seen here inset. 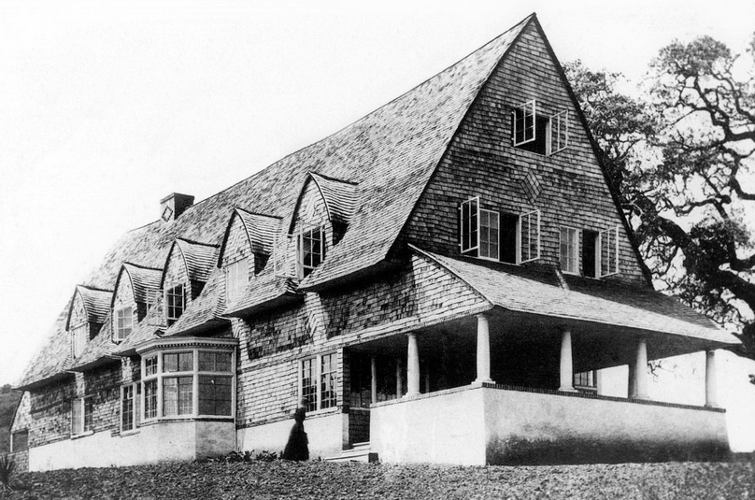 These designs would have been structurally unstable because the upper portion of the gambrel roof was too broad; the static load would have predominantly pushed outward instead of downward. 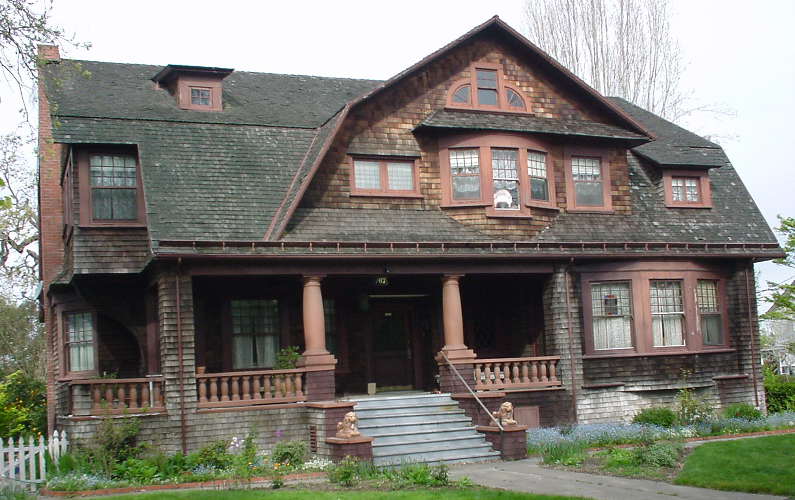 As a result, Stickley's design and this one would have probably fallen apart under stress – such as the 1906 earthquake. That he copied Stickley's roof profile makes another point: Jones – like most architects of his day – were terrible engineers. This photo from 2006 before restoration began shows Jones also did not understand the physics of rainfall on this type of roof. Note previous owners installed a rainstop at the end of the roof to slow the deluge in a heavy rain. The real problem was that over two-thirds of the water was funneled down the side seen here on the left. The real solution was to add gutters twice as wide and deep as the original plus a diverter where the angles change. Let's end this survey of young Brainerd Jones with the earliest known picture of him. Here he is, age 39, at the groundbreaking for the clubhouse just mentioned. As you can see, he was a short man and was apparently sensitive about that; in the voter registrations his height kept growing from 5' 6-3/4" to 5-7 and then 5-8. But at this point in his life he had designed at least 25 homes as well as commercial buildings and a remarkable public library. Should he have retired on this day he would still have left a towering legacy – but he remained working at his drafting table for another 37 years. So let’s ask again the questions I raised at the beginning. Was he a genius? It’s jaw-dropping that he accomplished this work with his minimal training and education apparently limited to what he read in magazines and saw on the street. Yes, his lack of engineering caused some of his buildings to be flawed, but so were many of the works of Frank Lloyd Wright. Were his designs architectural masterpieces? I would argue the Petaluma Museum qualifies. It’s neoclassical but also original, with yet another take on deconstructed Palladian windows. And then there’s the stained glass dome - something usually found in upscale hotels and businesses or churches. And that raises another “how easy it is to screw up” test; since this is a library and patrons are supposed to be looking down at books, wouldn’t clear skylights and hanging drop lights be more practical? And I believe every home he designed was considered a masterpiece by its original owner. Each was designed to fit their tastes and lifestyle like a glove. Mrs. Brown obviously wanted an old-fashioned design and Jones gave it to her, yet without larding on Victorian ornamentation. Blitz Paxton wanted the biggest house in town so he and his wife could throw lavish parties. And Jones gave him that, plus an ultra-modern look which was sure to draw even more attention to his ostentatious lifestyle. That, I think, was Brainerd Jones’ real genius; he listened intensely to his clients so as to fully understand what would make them happy. The design became a collaborative effort. And this also shows he deeply understood the principles of John Ruskin. When you live in a house that has been put together thoughtfully - even a simple California craftsman cottage - it has an impact on your outlook every day. And this is what Coxhead, Polk, and Maybeck also knew; Architecture should be about more than picturesque street views - it was about creating art someone actually lived in. Brainerd Jones designed high-fashioned mansions and simple homes; he was adept with both the old styles and the avant-guarde. If there was any other architect as versatile as this, I do not know who it is. Yet he had no formal training. He did not study architecture at any college, nor did he apprentice at a major architectural firm. His only credentials were having worked as a carpenter and a draftsman. Yet there he was at the turn of the century, hanging out his shingle as an architect. 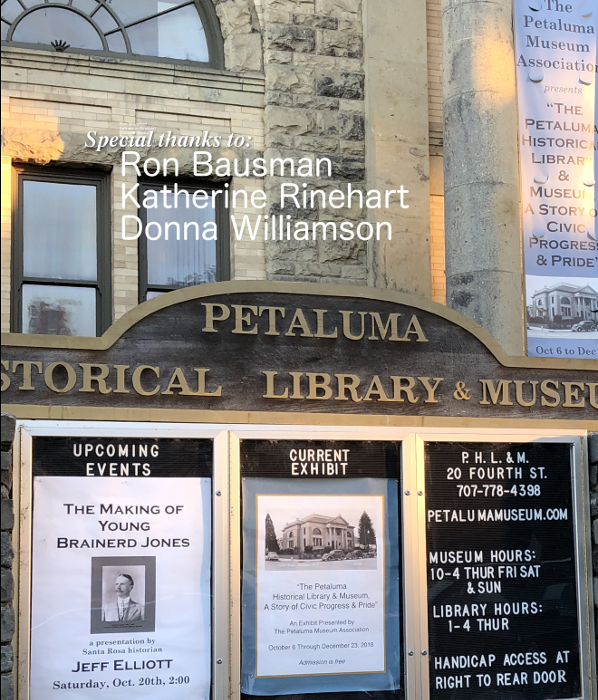 This is the first part of a presentation made at the Petaluma Historical Library & Museum on October 20, 2018, and explains the developments in late 19th century architecture which had the most impact on Jones. 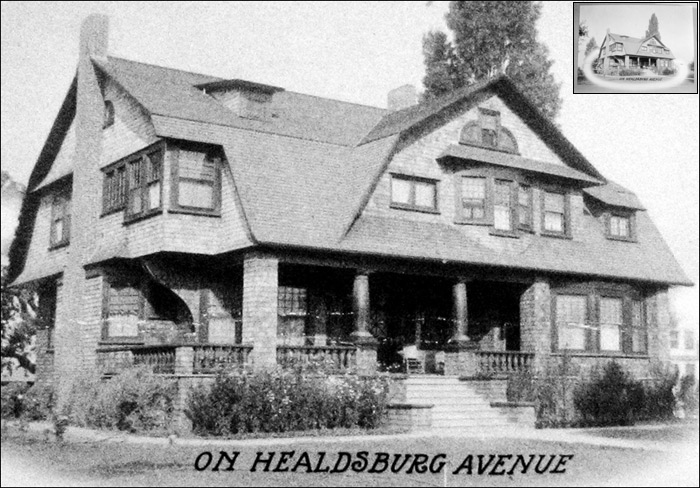 Part two covers his background and some of his residential architecture up to 1906. When Brainerd Jones was born in 1869, America was mainly a nation of plain Greek Revival farmhouses, federal style and assorted colonial styles that were rarely seen outside of the region where they emerged. Builders had limited skills and worked without plans, having previously built nearly identical houses many times before. Builder's guides and manuals often only contained directions on how to best follow classical principles and apply decorations. Modern American architecture started after the 1876 Centennial Exhibition in Philadelphia as a wave of nostalgia swept the country for the first time. Probably driven in part by escapism from hardships of the ongoing Long Depression, popular books and magazines glorified America's colonial past with sentimental tales of Revolutionary days of yore, illustrated with drawings of cozy cottages and Elysian farms, where everyone supposedly lived and worked in harmony and fought the heroic cause (the bloody and divisive Civil War had also ended just a few years before, remember). All things colonial became fashionable again, particularly furniture and building styles. Fairgoers also packed a replica New England Kitchen of 1776, where they could interact with players in colonial costumes. 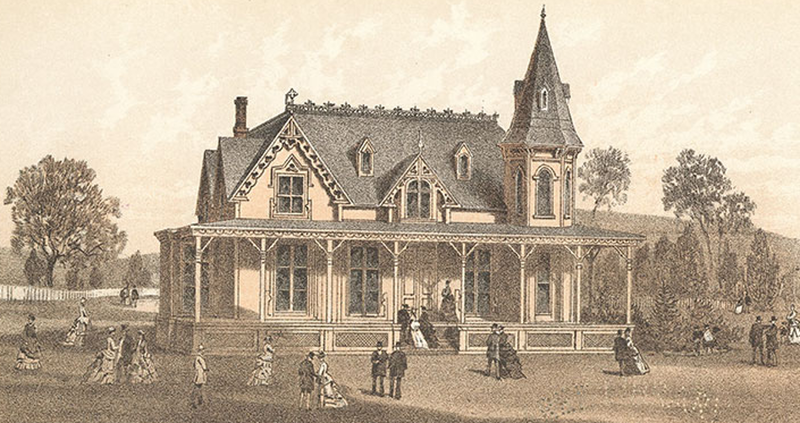 Pavilions representing the states, such as this one for Illinois, exposed the limited range of American architecture, where the Gothic style loaded with ornamentation was considered the ideal design. At the fair visitors encountered architecture completely unlike anything back home. Most talked about were the Queen Anne style buildings at the British compound. 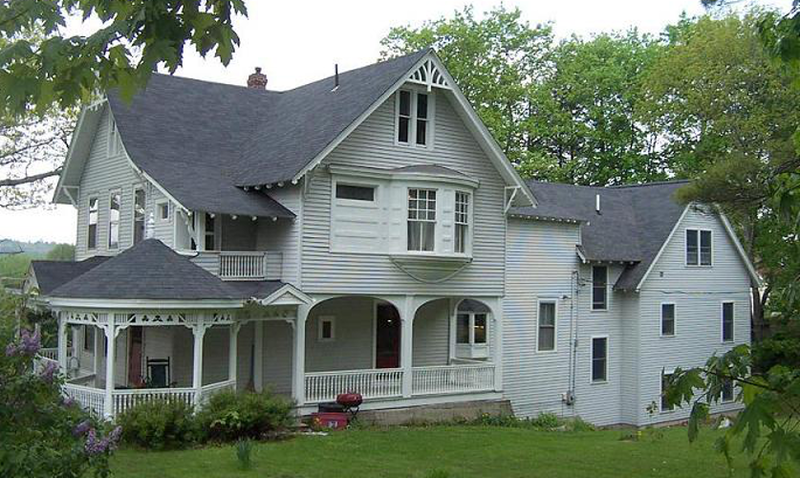 In England this revival style had been already popular for several years. About ten million people attended the fair, the equivalent of 1 in 5 Americans. 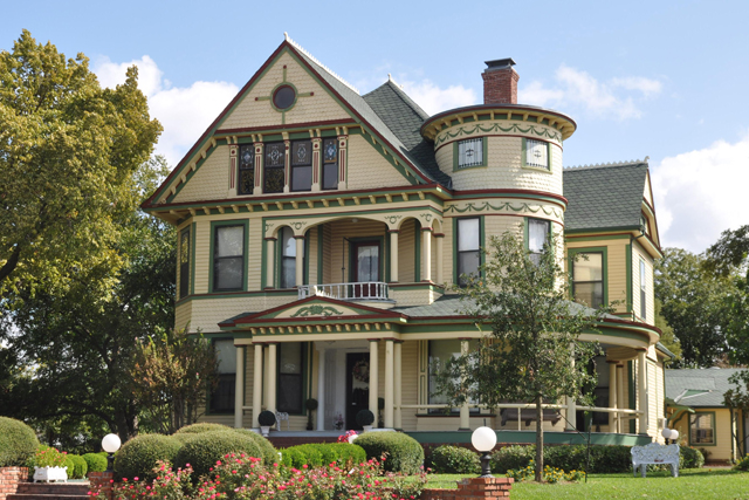 Victorian Gothic, with its busy gingerbread ornamentation quickly lost popularity as American Queen Anne evolved as the popular favorite nationwide. This house still has lots of scrollwork but also many of the curvy elements of Queen Anne, including a gazebo wrap. 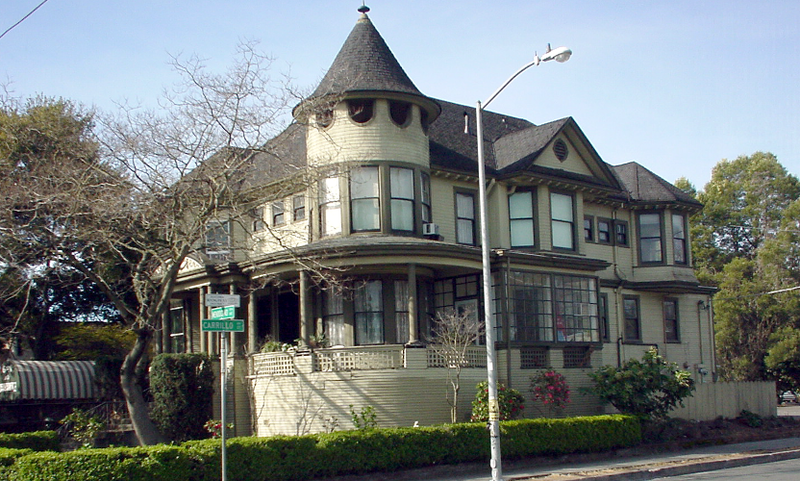 Another transitional Queen Anne, with more curved surfaces and a prominent, irregular roof. In a remarkably short time, Queen Anne evolved into the style we all recognize today, in all its boundless variations. But American Queen Anne lost all relationship to its historic roots; it was popular because it was a new, highly picturesque style. 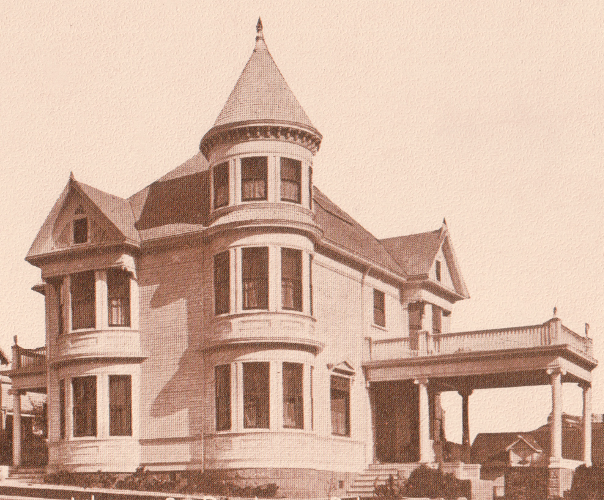 Where the Pacific states were usually slow to adopt new trends from the East Coast, Queen Anne emerged simultaneously throughout the country; this is the 1881 Atherton House in San Francisco. One reason Queen Annes caught on so quickly was because there was now a trade magazine that taught builders how to make those turrets and other unfamiliar elements. 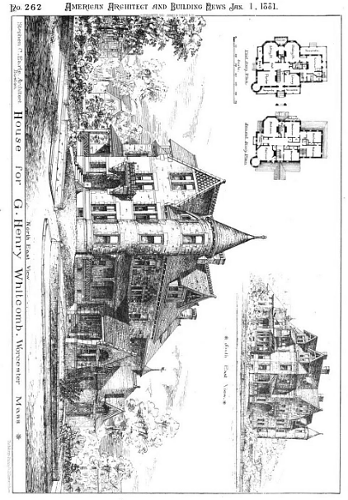 American Architect and Building News – which also appeared in the Centennial year of 1876 – did much to standardize building nationwide. 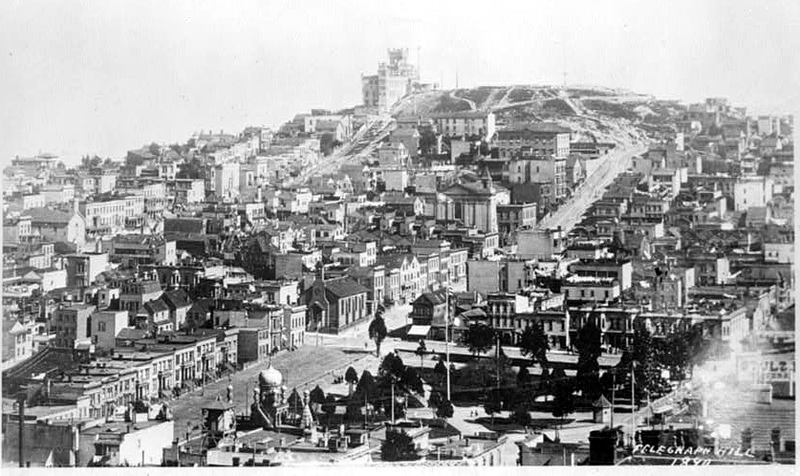 Through the late 1880s and 1890s, Queen Annes sprouted like mushrooms all over San Francisco. 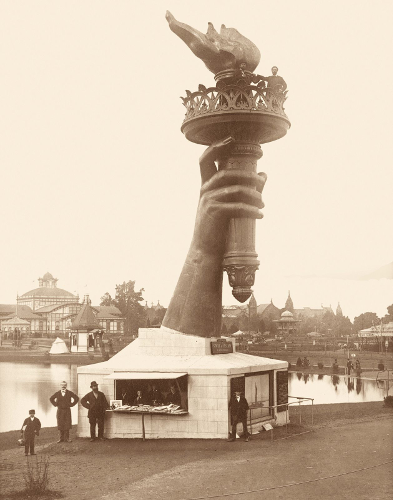 Let's rewind back to the Centennial Exposition to meet the birth of Queen Anne's twin. 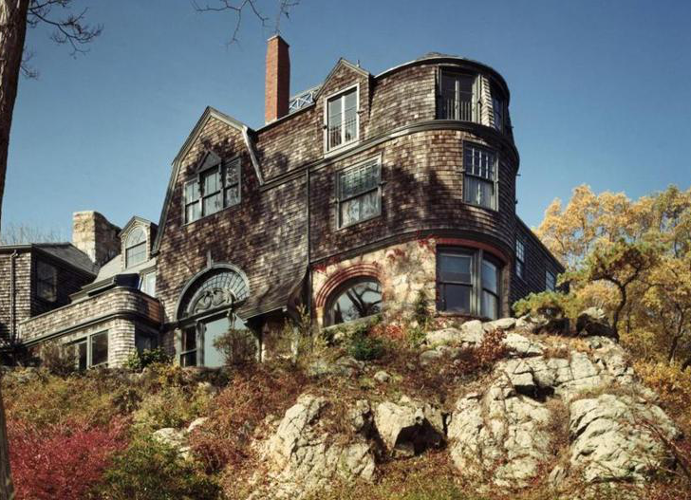 Now called “Shingle Style,” it was really Artistic Queen Anne, created by a cadre of East Coast architects, it mixed the Tudor elements with aspects of the Japanese building. Usually wider more than tall and with a prominent roof, the designs incorporated as many windows as possible and open interiors, which transformed hallways and vestibules from mere circulation corridors into living spaces. Unlike the popular Queen Anne style with its flashy look, these architects were consciously trying to create artistic houses that looked as if they could be centuries old. Plain shingles were sometimes aged in buttermilk or painted the color of moss. 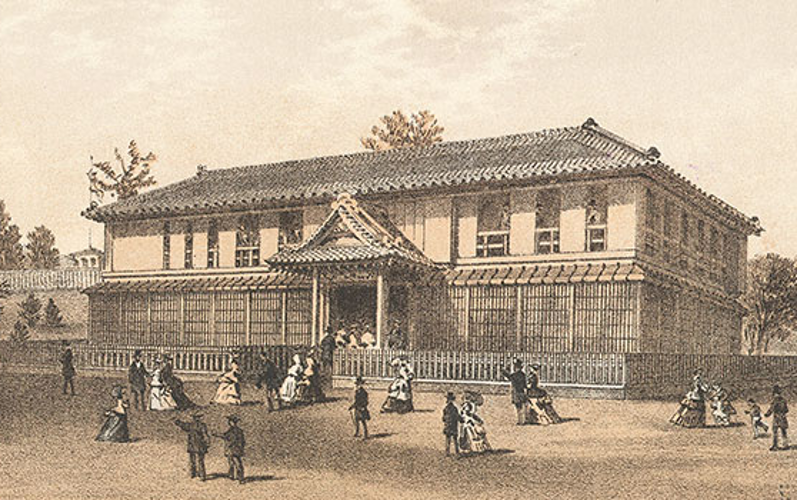 These homes had minimal ornamentation; notice here the fine latticework that suggested Asian wicker or rattan. In the letters section of magazines like American Architect and Building News and Harper's, philosophy and aesthetics were hotly debated. 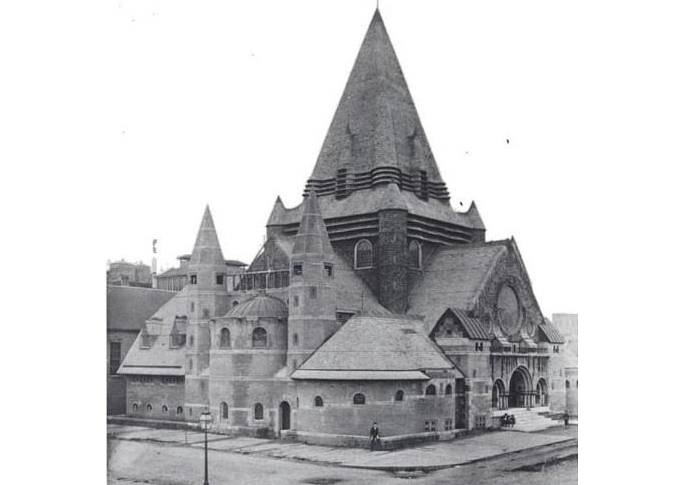 For some it was a crusade to forge a unique style of American architecture, while others argued a higher objective was “unity,” which meant in part that a building must be in harmony with its setting. And some designs look ultra-modern even today. 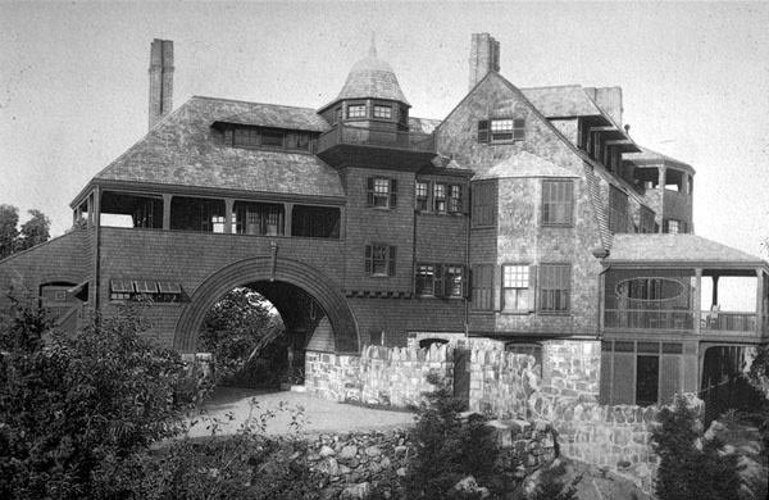 These mammoth “cottages” were commissioned by the wealthy families of the Gilded Age living in Newport and elsewhere in New England. 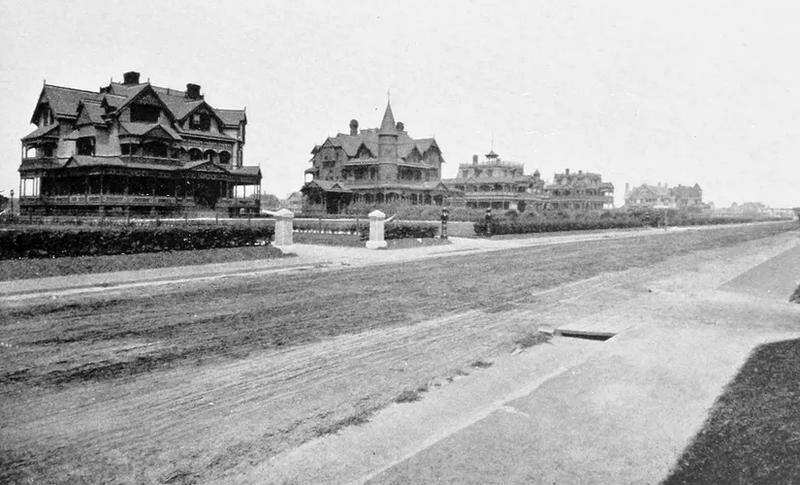 This is Elberon, New Jersey, which was the Newport for the nouveau riche. 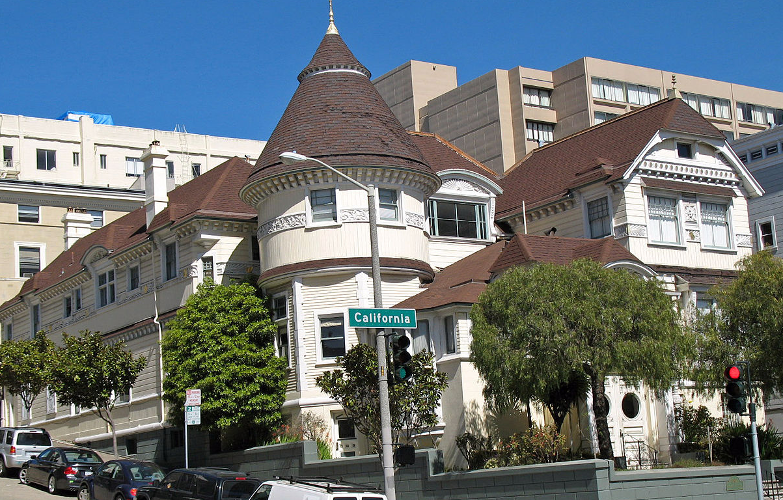 While popular Queen Anne was immediately embraced by San Francisco, it took ten years for Shingle Style to arrive. The city had a reputation as a provincial backwater indifferent to the arts, including architecture. Big commissions for commercial buildings went to firms in Chicago and New York. A. Page Brown opened an office in 1889 on a trial basis and soon found himself swamped with work. Brown, who had worked with the top firm working this style, McKim, Mead and White, hired Willis Polk, Alexander Oakey and other A-team architects from the East. Maybeck worked with the firm on and off for several years. 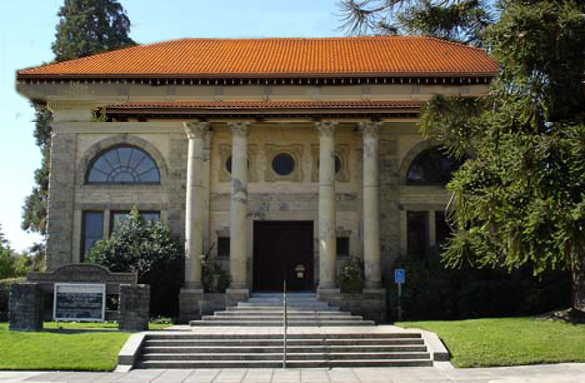 Fisher's 1892 Anna Head school in Berkeley is one of the few designs firmly in the East Coast Shingle Style, avoiding any ties to popular Queen Anne. A. 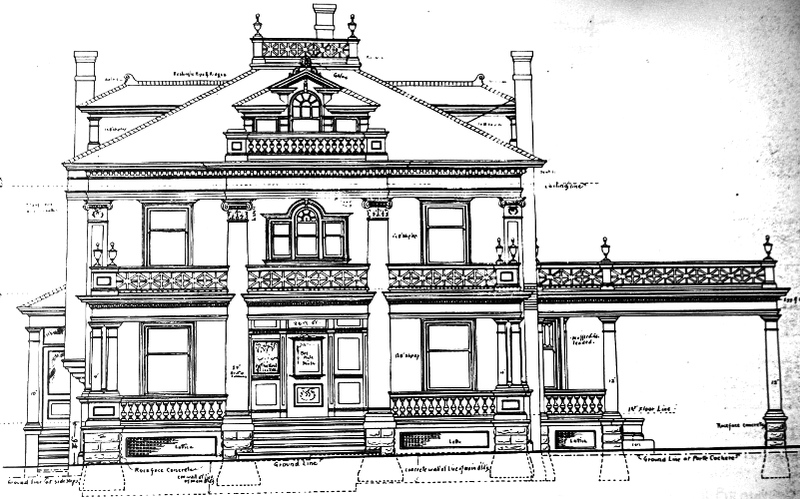 Page Brown's Crocker Old People's House in San Francisco, 1889. 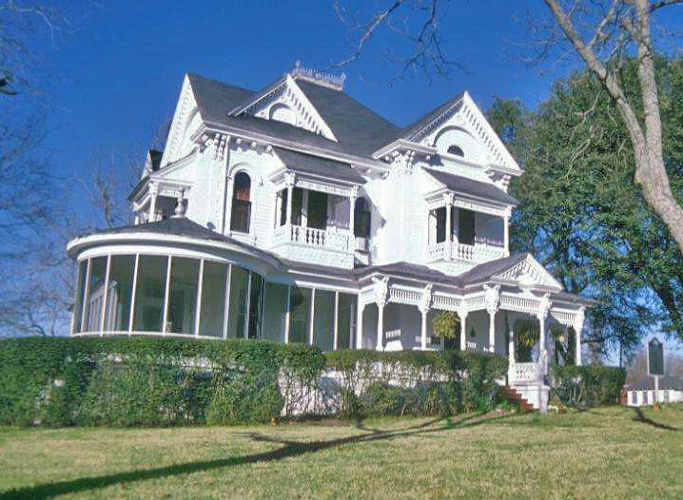 American Queen Anne and Shingle style architecture are two of the three significant influences on Jones as he began his career. The last element was the news stand. 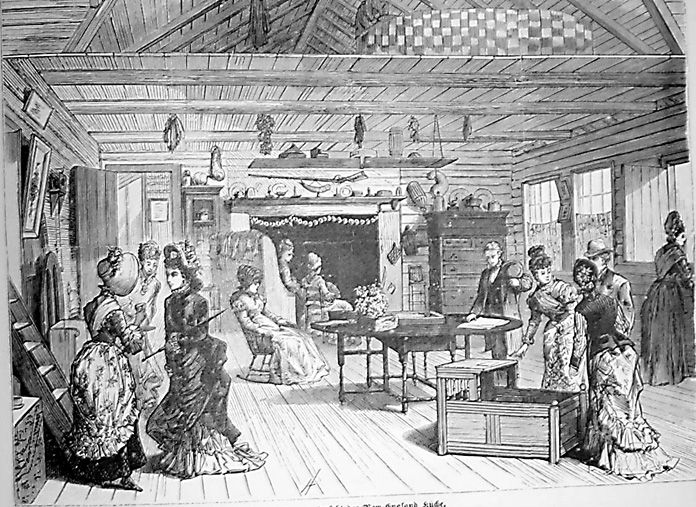 Trade periodicals had taught builders how to make a Queen Anne but in the mid-1880s, general public interest in home design was strong enough to support periodicals. Shoppell's was the most popular, selling about 10,000 copies of every issue by the turn of the century. George Barber's pattern books were the other main source for “mail order houses.” More than anyone else, Barber established the American Queen Anne style. His firm sold plans for over 20,000 houses, but it's likely a far greater number of houses were built without buying blueprints, instead improvised from the floor plans and basic drawing shown in his pattern books. 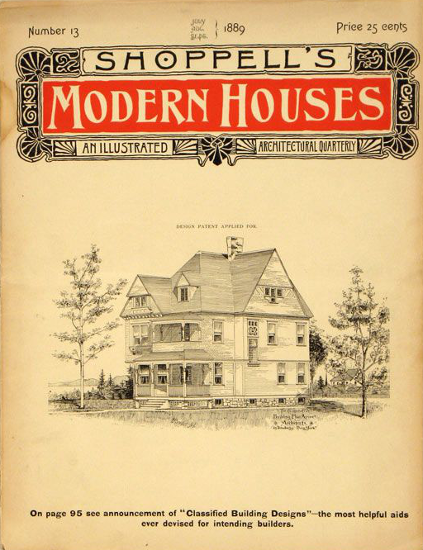 Barber launched his monthly “American Homes” in 1895 to appeal to a wider audience of people who may not be building in the near future. 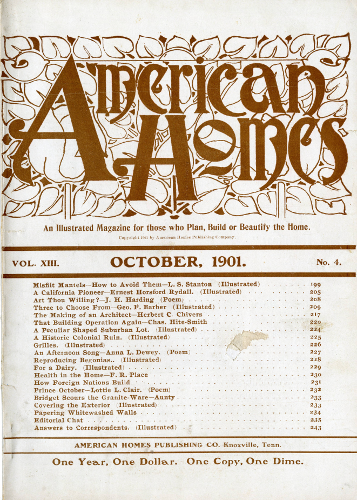 The magazine included poetry and general interest articles with many photographic illustrations. 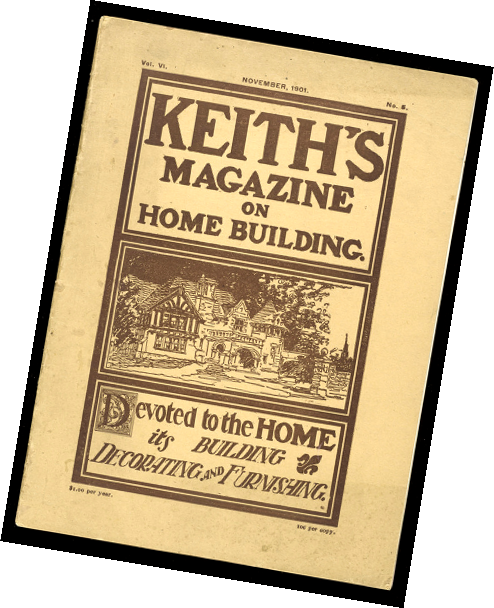 Keith's Magazine was somewhat like the nerdy Popular Mechanics/Popular Electronics magazines of the mid 20th century. Plenty of DIY projects and technical articles aimed at builders and architects. 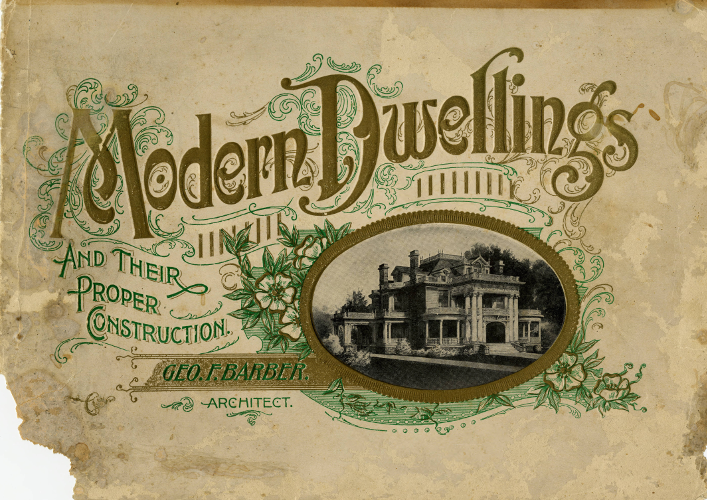 When Barber's American Homes ended publication the firm's designs were featured here. 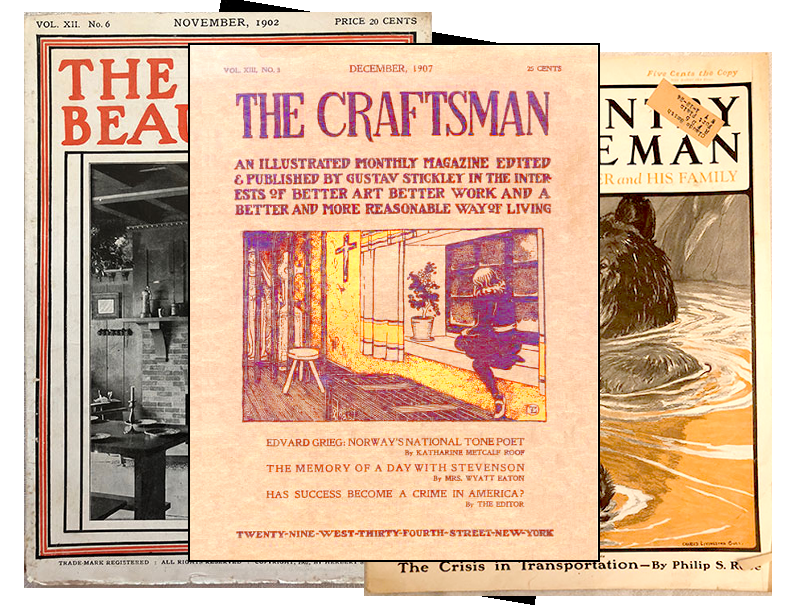 Gustav Stickley's The Craftsman was a true general interest magazine, with short fiction, poetry, children's stories as well as in-depth articles about all kinds of art, particularly fine furniture and home decoration. 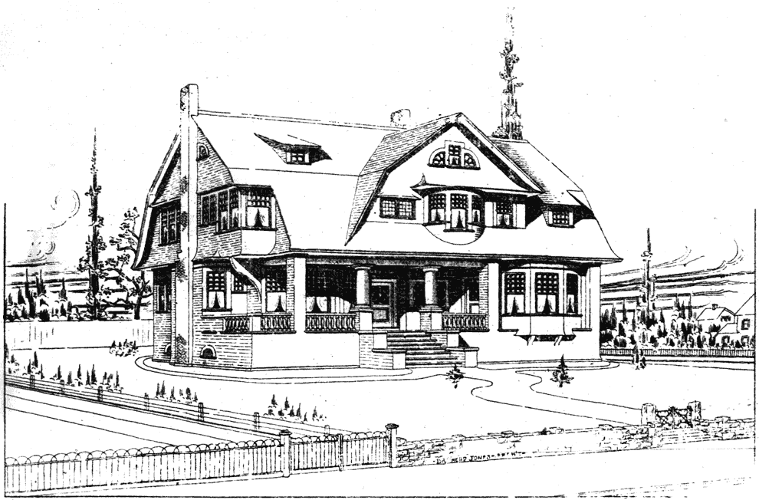 The magazine popularized the word, “bungalow” and nearly every issue included a “Modern Craftsman” house design following the clean look of the Arts & Crafts movement, free of decoration and with exposed construction elements, Stickley's houses meshed with the philosophy of John Ruskin, who promoted skilled craftsmanship and the pleasures of a simpler way of life. 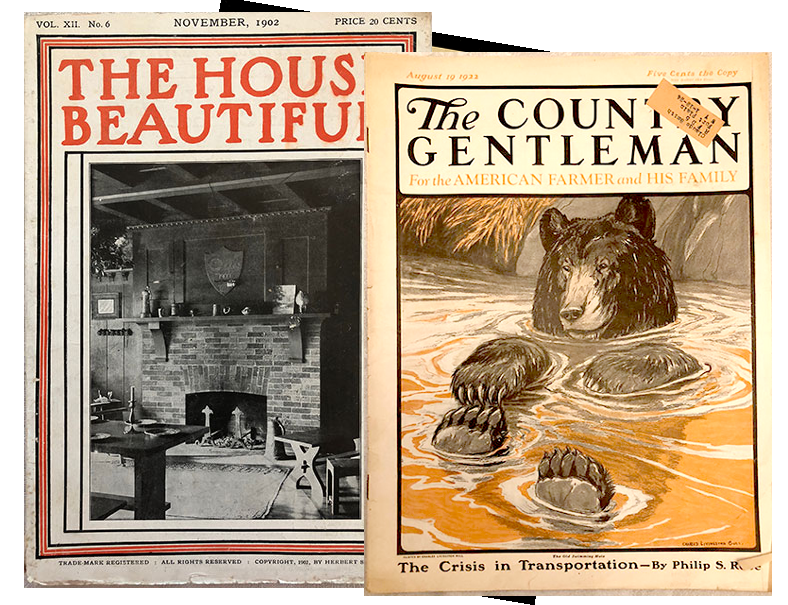 A group of magazines such as shown above is probably what Brainerd Jones saw on the coffee table (dining room table, actually) when he first met with a new client. With so much exposure to modern architecture through popular media, they already likely had strong opinions of the kind of home they wanted Jones to design, making it more of a collaborative effort with the architect. This helps explain why Jones' work represents so many different styles.